This version of Shinobi was released exclusively in Japan on the PC Engine and handled by Asmik instead of Sega. It retains the one-hit kill nature of the arcade original instead of using a life bar like the Master System version. The high quality graphics might initially fool you into thinking this is an arcade-perfect port but unfortunately many things were left out in order for it to fit onto a single HuCard; in particular, the memorable Black Turtle stages are completely absent. There's also no Bonus Stage (as the console couldn't handle the scaling effect), no close combat attacks and hardly any speech. 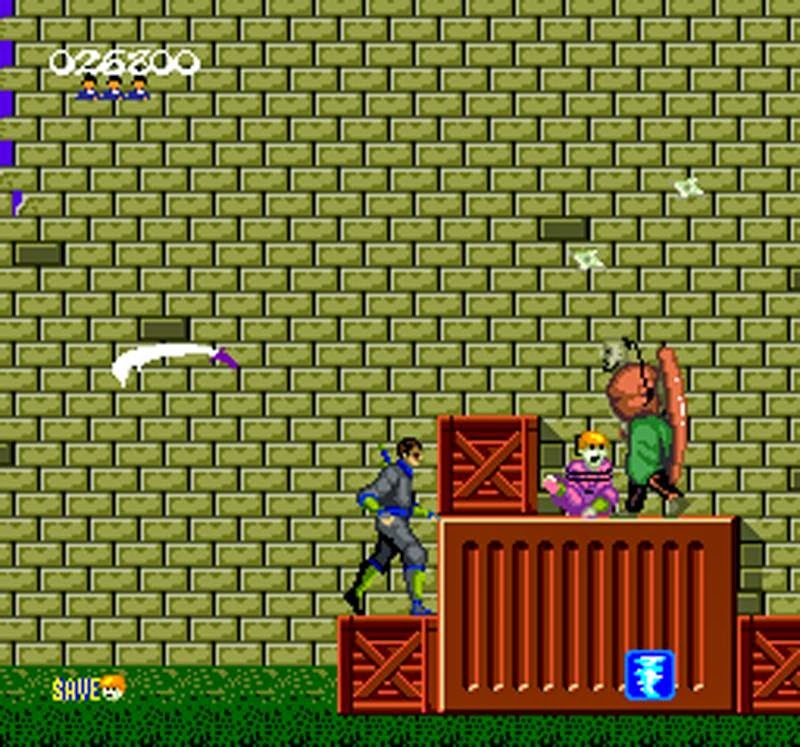 Certain enemies are missing too such as the Bazooka guys in the Mandara stages and the Monks in the second Masked Ninja stage. While it still plays and feels like Shinobi these omissions are really disappointing. The game is very challenging and I would even say that it's tougher than the arcade version. This is mainly due to the lack of a bullet power-up which originally allowed you to take down enemies with greater ease. At least you still have one item of magic that you can use per stage and you'll definitely need it when 5-6 enemies attack you from all sides. The stages that have been included here are well recreated and the level design is as good as ever. Each boss plays similar to the original except Mandara as you'll only see one row of statues instead of three, again possibly due to space or technical limitations. Once you've defeated the final Masked Ninja boss you'll see a message that I assume ties the whole story together. Unfortunately I couldn't actually read it as it's in a strange font and the text scrolls too quickly! Shinobi is still a good game but it's clear that a lot of compromises had to be made for the PC Engine. This HuCard version might capture the spirit of the arcade original but there's too much missing to recommend it. Random trivia: Joe Musashi is commonly known as the main character in the series yet he hasn't featured in a starring role since the Mega Drive version of Shadow Dancer (1991). Various characters have since assumed this role including Hibana, a female Shinobi, in the 2003 PlayStation 2 game Nightshade.